The story of Weird Portland United begins with one of Portland’s weirdest citizens, Brian Kidd, a.k.a. The Unipiper. In the mid-2000’s, at the time when sightings of a man on a unicycle with flaming bagpipes were just beginning to make the rounds, the city was in the midst of a cultural and creative renaissance. Affordable housing was accompanied by burgeoning scenes surrounding the art, music, food, and alcohol communities, all serving to highlight Portland as a hotbed of cultural innovation. Given Portland’s reputation as an incubator for counterculture movements and offbeat attractions, ‘Keep Portland Weird’ became the rallying cry uniting citizens to support local businesses and stop corporate homogenization of the urban landscape. And for a while, it worked. From 24-hour coin-operated churches worshiping the King, to contraband ringed pastries laced with over-the-counter pharmaceuticals, to a thriving underground organic wrestling scene, Portland was weird and proud of it. Economic recession soon followed and Portland saw another influx of creativity in those looking to escape the high cost of living that had taken hold in other places. With low financial risk and minimal startup costs, food carts exploded in popularity as a way for culinary entrepreneurs to offer reasonably priced food to a penny-pinching populace. 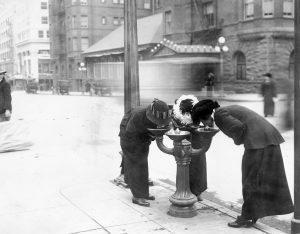 In this way experimentation was incentivized and Portland was rewarded with variety and diversity in food options second to none. The food cart scene was but one example of the cultural transformation underway. Lightning was bottled, offered for sale, and the citizens of Portland were buying. The excitement that was turning folks on to Portland could not stay hidden away from national attention for long. Portland was weird. Portland was different. Portland was cool. And suddenly everybody wanted in on the action. For better or for worse, 2011 saw the debut of a little television show called Portlandia, set in a fictionalized version of our very real town. The rest of the country turned its gaze to our neck of the woods and suddenly grandmothers in Wisconsin were talking about putting birds on donuts. Portland-mania had reached its peak and the Rose City would never be the same. For a time, all was well. Portland prospered and took pride in its newfound sense of fame. The city was growing at a rate the likes of which it had never seen, nor planned for. And it was not without side effects. Business moved in and tourism skyrocketed. So did housing prices and the cost of living, forcing out many longtime residents and creatives alike. As interest in Portlandia waned and America’s collective fascination moved on to the next darling city, we found ourselves lost in an identity crisis without a roadmap. And so it was at some point during this period that the popular perception of Portland as America’s weirdest city started to shift. Our weird was diluted; sidelined in favor of safer options with broader appeal. It’s becoming harder to remember why we were bestowed all of the attention now in the first place. The threat of homogenization is back, and this time it’s going to take more than a slogan if we want to save the weird. Thus is the reality of Portland today, still patrolled by a man on a single wheel with pipes aflame. Drawing inspiration from other local action-oriented charities, The Unipiper dreamed of a way to prevent the weird from being swept under the rug. His idea was to establish a non-profit that would make ‘Keeping Portland Weird’ its official mission. 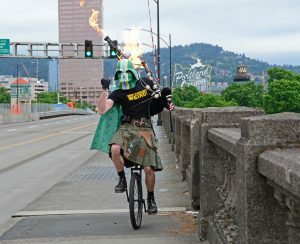 Through the activities of this organization, The Unipiper hopes that Portland will forever remain a place where all are afforded equivalent opportunities to stand up and be recognized their unique talents, where creativity and self-expression are valued above all else, and where experimentation is again encouraged and the fear of failure is easily overcome. Every voice in Portland deserves to be heard, especially the weird ones. And so it is that WPU aims to spark the imagination of all Portlanders including the next generation of weird. Our story is a strange one and it is worth remembering. Part of the appeal of our brand of weird is that it refuses definition. Ask 100 Portlanders what weird means to them and expect 100 different answers. So under that banner let us come together, all who identify as weird. It’s time to unite the Elvis worshipers with the llamas, and the UFO museums with the drunken Santas. Together we hold the power to build a weirder future for America’s weirdest city. Weird Portland United discovers, promotes, and nurtures the creators and risk-takers that Keep Portland Weird. In the face of rapid change we protect and lead Portland’s culture so that all Portlanders, from natives to newcomers, can contribute to our city’s now famous culture of weird. By bringing those together who similarly dream of a weirder tomorrow, we find Portland voices that otherwise may have gone tragically unheard. WPU relies on private donations, sponsorships, memberships, and public and private grants. The cultural, economic, and artistic portraits of Portland were painted from vibrant, colorful palettes. It is a past that we are proud of, and one we seek to sustain. We hope you will join us in honoring and reclaiming Portland’s weird past while we encourage an even weirder future. Awarding Weird Portland Grants that will help discover, support, and cultivate new talent, giving up and coming purveyors of weird culture a platform to grow. Building weirdportlandunited.org into the definitive guide to all that is weird in Portland through exhaustive cataloging. Achieving recognition and preservation of Weird Historic Places through an official register of sites, ensuring our weird heritage lives on for generations to come. Establishing the ‘Weird Portland Spirit Awards’, recognizing citizens for their contributions to our collective cultural identity. Recipients would be eligible for induction to the ‘Weird Portland Hall of Fame’. Raising funds and finding a home for the ‘Weird Portland Museum’. Sponsoring tours of Weird Portland. Organizing Weird events and festivals like Weird Bicycle Rides, Weird Art Shows, Art Car Shows, a Weird Beer Showcase, and ultimately a city-wide Keep Portland Weird Festival. Purchasing billboard space throughout Portland for strictly weird use only. And most importantly, providing a platform for similarly minded citizens to connect, collaborate, and celebrate our cherished values of self-expression, creativity, and diversity. What's with the WPU Logo? 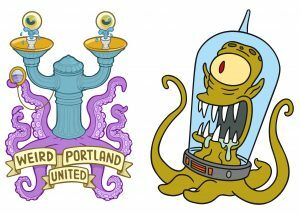 The Weird Portland United logo pays homage to Portland’s historic ‘Benson Bubblers’ found throughout the city. By first starting with an existing Portland icon, our idea was to transform it in a totally unexpected way and create something entirely new but yet still uniquely Portland. 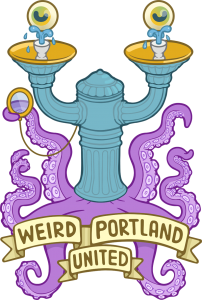 It wasn’t much of a stretch adding tentacles coming out of a bubbler once we started thinking about the idea of a new Portland mascot. The result was Benny, the living Benson Bubbler! 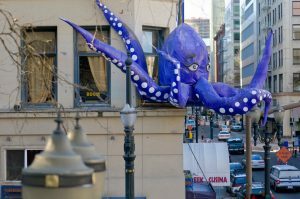 Fun fact: the color of Benny’s tentacles is a reference to the famous purple octopus that hung above the Greek Cuisna restaurant at SW 4th and Washington for more than 20 years! Editor’s note: Any resemblance to the tentacled space aliens of ‘The Simpsons’ fame is purely coincidental. As a Portland native himself, we like to think Matt Groening would approve of this little nod. Nicholas Beatty – Secretary and Web Content Mgr.